International nurses day: The unsung heroes of our health system. Why nurses don't mind bloody hard work. Nursing is not for the faint-hearted, and I’m not just talking about the blood. Nurses and midwives welcome us into the world, help us stay for as long as possible and often comfort us in the end — but it’s no secret they are often overworked and under-supported. Those professional stresses often feed into their personal lives, taking a toll on finances, relationships and mental health. Female nurses and midwives have a suicide risk almost three times the rate for women in other jobs. For males, it’s one-and-a-half of that for men in other professions (alarming when you consider the already-high rate of suicide in men). It can be a gloomy picture for those we can’t live without, but still, there are more than 360,000 nurses in Australia. You probably know a few. On International Nurses Day we ask these Aussie legends, why be a nurse? Farron Sullivan used to complain about the sleep deprivation associated with nursing, but then she had triplets. 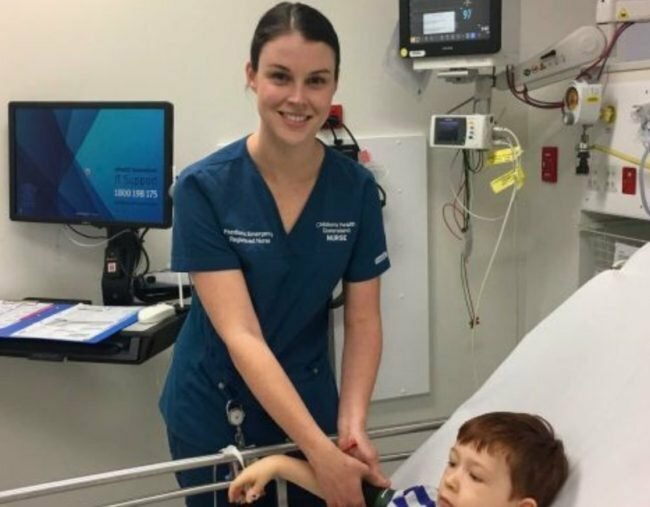 The 26-year-old works at Brisbane’s Lady Cilento Children’s Hospital in the emergency department (ED). Nursing was always a path she wanted to take, following in the footsteps of her mum and step-father. “My step-dad has been an emergency nurse and I was really inspired by them,” she says, adding at six years old she knew it was the career for her. Since becoming a mum, Farron has reduced her working hours to two days a week, which she says can be a break from home life. But it’s the emotional side of working in the ED the registered nurse struggles with. “It can take a massive toll on me because I am someone who is very emotional and I care a lot about people’s thoughts and feelings,” she says. Farron says support from work colleagues and in-house counselling is key, because she wouldn’t choose any other career. A rollercoaster is how 22-year-old Joshua Banner would explain his role in the intensive care unit (ICU) at Westmead Children’s Hospital in Sydney. “You don’t know what is around the corner, but you just hold on and keep going,” the registered nurse says. Joshua decided to become a nurse while working with vulnerable children overseas. Joshua, who describes himself as a foodie, gym-lover and adventurer, says the toll nursing takes can sometimes impact on his personal life, but the reward of supporting families gives him a sense of purpose. “In the ICU we see the parents and the children at the absolute worst time of their life. Joshua says he holds memories for the children who “don’t end up the way you hope”, but is comforted by those that do. Registered nurse Sharee Rayner, who provides in-home aged care and disability support for Just Better Care in Melbourne, says it is a “privilege” to be part of a family’s intimate moments. “We get to be a part of life coming into the world, and people leaving the world,” she says. Sharee has been present for the passing of several patients and describes those moments as an honour. But the role of nurse doesn’t come without sacrifice for the Melbourne mother, who says missing out on time with her children has been hard. “The guilt, it gets to you — I haven’t walked the dog, I haven’t cooked my child a meal in three days. “You’re there looking after patients, making sure they are safe, nurtured, fed and given emotional support then you go home and walk in the door and the kids ask what is for dinner. Graduating through the hospital system in 1987, Sandra Holland has led a colourful career mainly focused on paediatrics and neo-natal care. She even took a hiatus driving a delivery truck when she felt totally “burnt out” by the health industry. Today, Sandra is a clinical nurse consultant at Sydney Children’s Hospital where she works closely with Save Our Sons — a group seeking a cure for Duchenne muscular dystrophy — the number one genetic killer of young boys. “It’s not a glamourous type of job but it’s very rewarding … supporting families,” she says. With only four nurses in Australia with the capabilities to wholly support the 800 families affected by the condition, Sandra’s expertise is in high demand. But despite her experience, her skills are not always acknowledged. “Sometimes we are viewed as a service industry, that we have to be there, and not always given credit for our knowledge,” she says.